Introducing a new ESP8266 Development Board with an ESP-12, a 3x AA battery holder, a voltage regulator, an RGB LED, several red LEDs, and a light sensor LDR on the ADC input all on one board. The board can be controlled by an open source Android App which is available from the AI-THINKER Website. GPIO pins are extended with berg pins for easy external connections. RXD,TXD & GND pins are provided for programming / firmware upgrading. A yellow jumper is provided to pull GPIO0 pin to GND during programming. During normal operation this jumper must be removed. The board is powered by 3 nos AA batteries , for which a battery box is already wired. 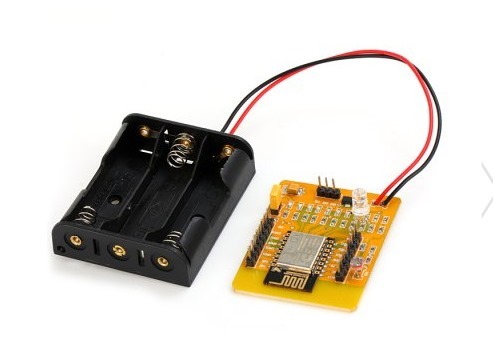 On board 3.3v regulator is provided for a stable power supply. No power switch or Reset switch is provided. To switch off you need to pull out one of the batteries. The board comes pre-loaded with a demo which does actually seem to work. If you have an Android based phone or tablet you can download AI-Thinker’s app to control and mix the color balance on the RGB LED and to switch the other LEDs on and off. There are also 6 red LEDs fixed with the necessary resistors connected to GPIO16, GPIO14, GPIO5, GPIO4, GPIO0 and GPIO2. A BLUE LED is always ON if the board is powered. The GPIO13, GPIO12 and GPIO15 are connected to a RGB LED which allows you color mixing using PWM. If you don’t want to use the light sensor or the LEDs you can simply clip them off. Then you’ll just have an ESP8266 with 3xAA power supply, 9 available GPIO pins and one ADC. On the playstore of your Android device search for IOT DEMO App & install it. Open the Settings & enable WIFI of the Android phone.Now power on the ESP board to see the AI-THINKER SSID on your mobile. Now open the app & touch on LED 1 to 6 , to see the corresponding light glowing on the ESP board.On the top you can see 3 icons with sliders in the App. Use this to mix colors on the 3 color LED of ESP board. Once the functioning of board is verified , you can proceed to connect the GPIO pins of ESP board with a 4 channel Relay board. 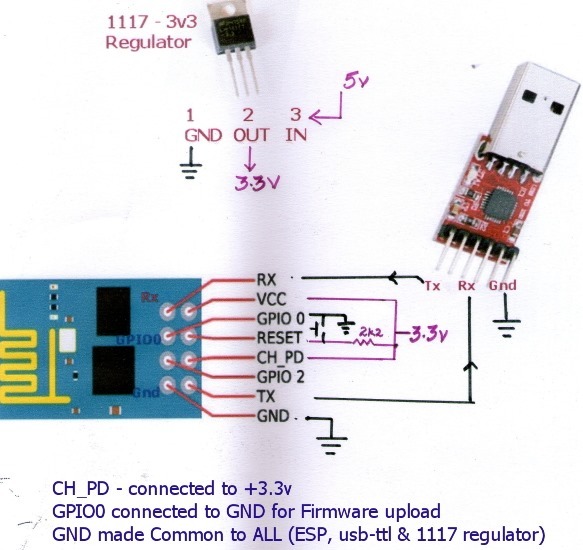 The 4 channel relay board used requires a separate power source of 5V, 1amp.For demo 2 of the GPIO pins are connected to relay 1 & relay 3.The GND pins of both ESP & the Relay. board to be made common. 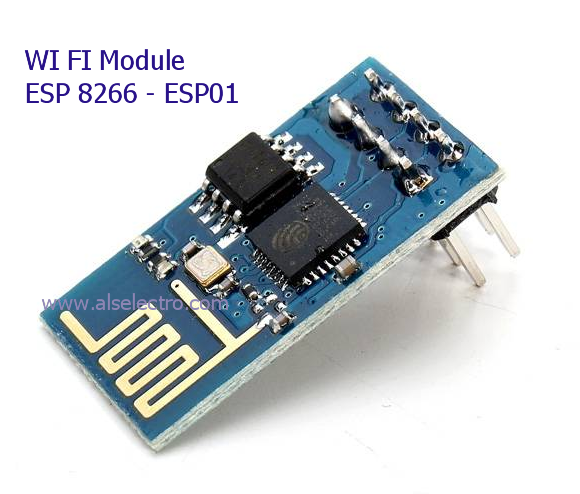 ESP8266 WIFI Module comes with an inbuilt firmware which supports serial interface and can be controlled using AT commands. Even though we can use this module to offer WiFi functionality from another micro controller ,this module is not just a simple serial to WiFi transceiver . It is comprised of a 32Bit processor ( 80MHz) , 512KB SPI FLASH , 64KB SRAM ,96KB DRAM , GPIO Pins & WIFI Transceiver. 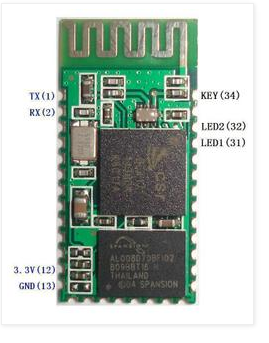 In this post I shall walk you through how to upgrade new Firmware on to the ESP module.This procedure can also be followed in case esp8266 stopped working , or giving out some random garbage data. Before starting upgrading I downloaded following 2 files . I used a USB – TTL converter between my ESP-01 board & PC. As the ESP device requires 200ma current which cannot be sourced from USB-TTL module , I used a separate power source 5v/1Amp adaptor followed by a 3.3v regulator ( 1117 3.3v). Please note that while I used a separate power source for ESP module , the operation was smooth. RST is pulled HIGH through a 2k2 resistor.A press switch is connected to GND , so that when it is pressed RST pin is grounded. RX is connected to TX . Vcc is connected to +3.3v of the external Regular. GND is made common for all , i.e GND of ESP ,USB-TTL & that of 1117 regulator are ALL MADE COMMON. GPIO0 pin is connected to GND to upload firmware. 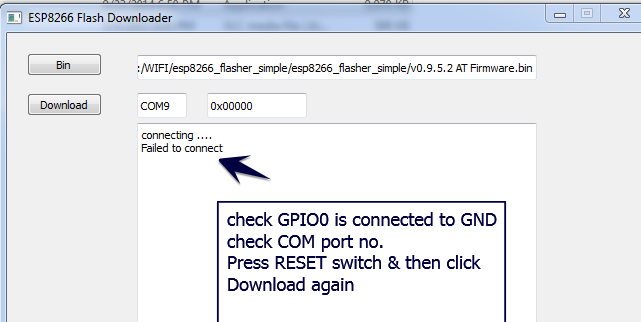 After uploading firmware , this GPIO0 connection must be removed from GND. 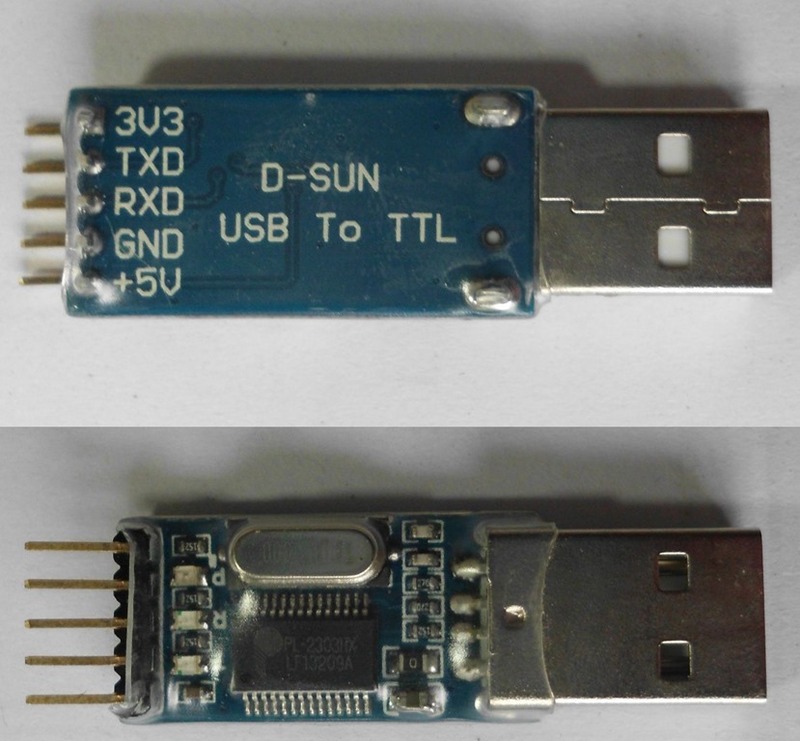 The USB-TTL converter I used is built on Silicon Labs CP2102 chip which is highly reliable one.The other type available in the market is built on Prolific chip (Chinese one , not original) , which has got some issues with driver installation . 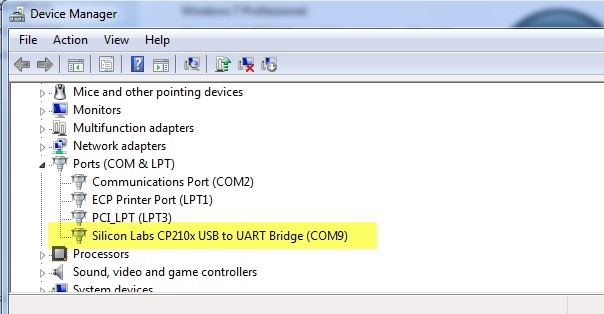 I connected the USB-TTL board to my PC & from the Device Manager I noted the Port allotted . COM port COM9 is allotted. 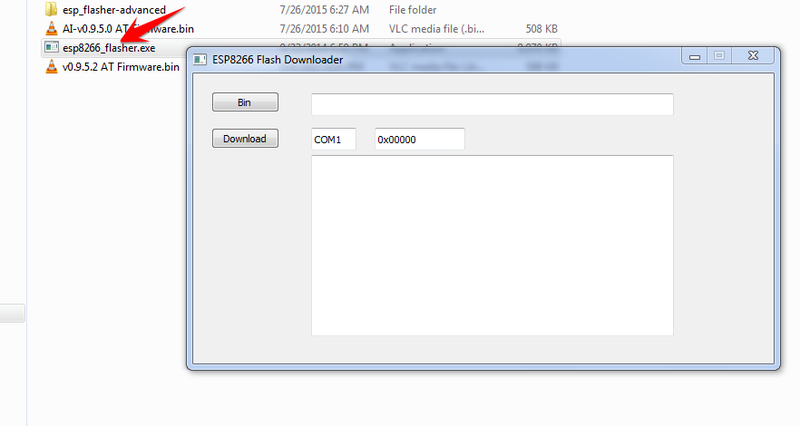 Next , I browsed to the folder where I’ve already downloaded the 2 required files , one is the simple flasher & the other one is the latest firmware to be uploaded. 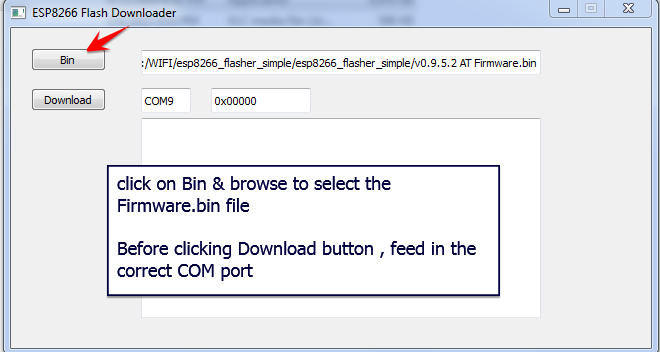 I clicked on the BIN button & browsed to the location of the folder to select firmware.bin file. Before clicking the DOWNLOAD button I changed the COM port number , where USB-TTL is connected to PC. First time when I clicked the Download button I got “Failed to connect” error. This was because I’ve connected GPIO0 to GND after the power to ESP board is ON. 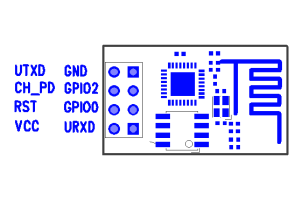 GPIO0 pin must be at GND level when the power is initially provided to the ESP module. Second time when I clicked on the Download button , Writing started but abruptly failed . 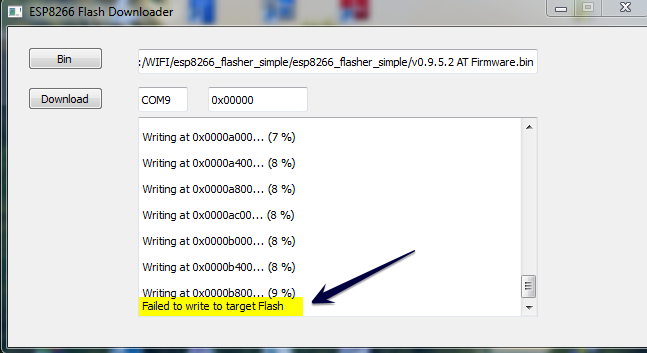 You can see the “Failed to write to target Flash” message in the screenshot below . Finally I hit the Download button and waited for the flashing process to complete. The STATUS BLUE LED blinked fast while the uploading was going on. 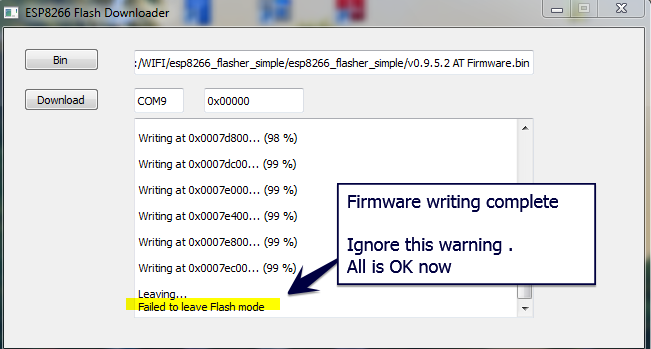 “ Failed to leave Flash mode “ message after 99% writing ,does not affect the flashing process in any way and can be ignored. 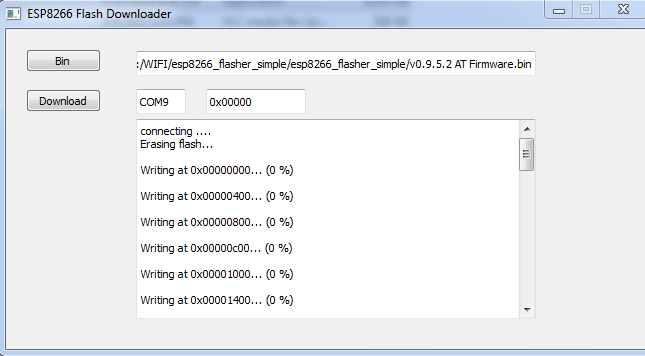 After the firmware flashing, ESP8266 module settings changed. 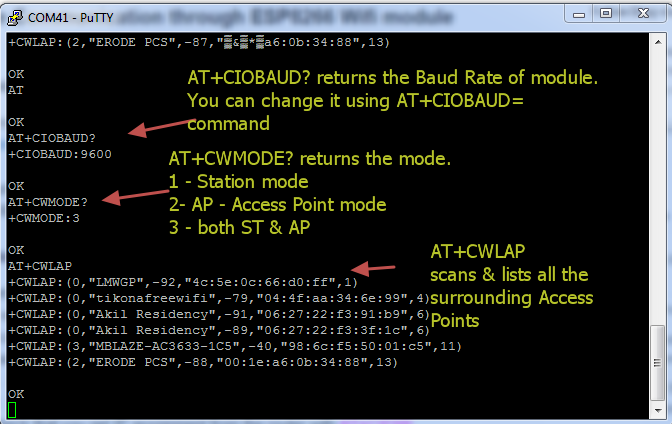 The default baud rate now is 9600 & can be modified using AT+CIOBAUD command. It is even possible to cloud update ESP8266 Wi-Fi module firmware using AT+CIUPDATE command.But I suggest you not to try this cloud update , as it’s got some issues. Now I removed GPIO0 pin from GND & pressed RESET switch & then closed the Flasher application. I opened the terminal software Putty & selected Serial COM Port 9 & baud rate 9600. I typed in AT command & got an OK response from the ESP module. 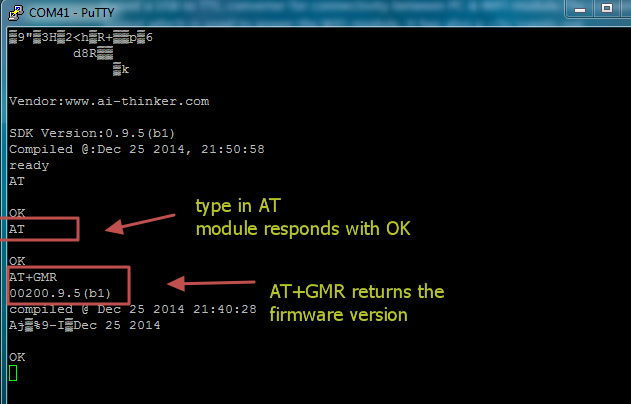 AT+GMR returned the upgraded firmware version 9.5. After struggling for nearly a week with MTS dongle , finally I found an excellent solution to enable PORT FORWARDING. 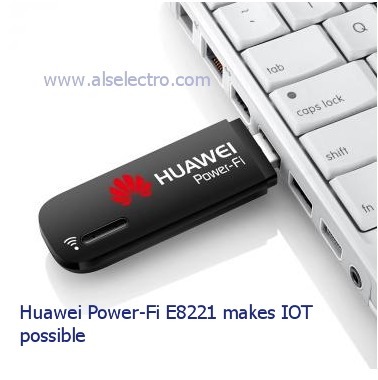 HUAWEI POWER FI E8221 model dongle is the solution I found.This dongle accepts any data SIM for internet connectivity & we can create a WIFI HOTSPOT with this dongle to connect max. of 10 devices. 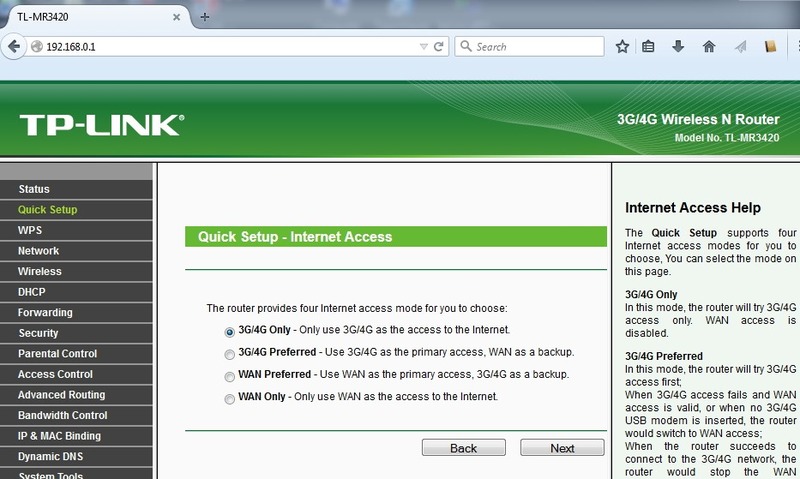 Further it has got a VIRTUAL SERVER setting tab in the configuration , thus enabling Port forwarding. 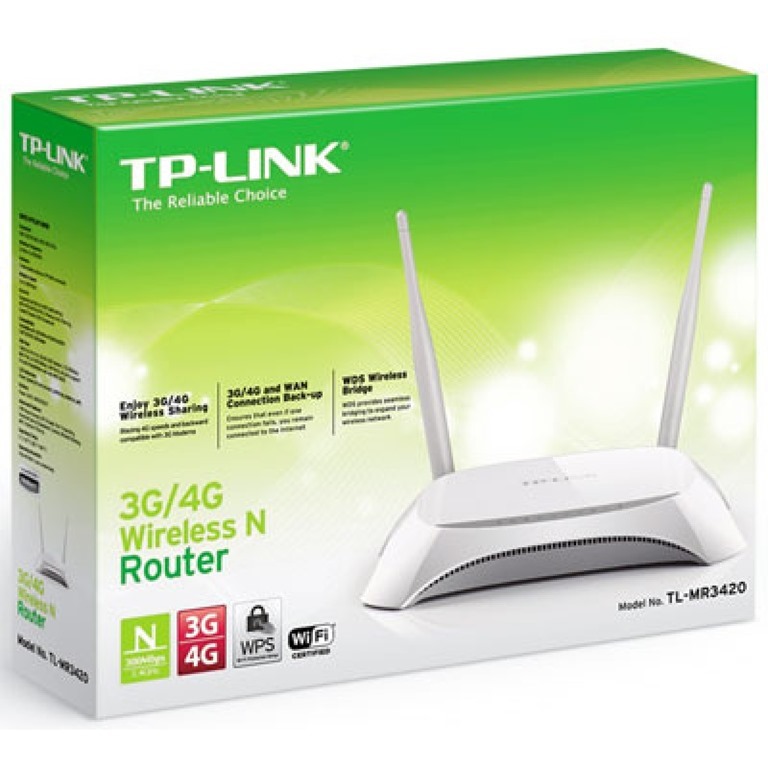 There is no need of an external Router like TP-LINK (which I used with MTS , as seen in my previous post). 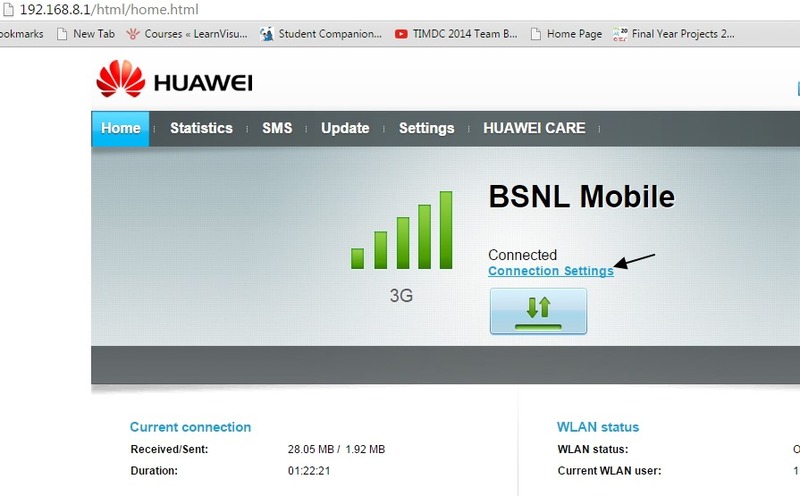 I’ve inserted a BSNL DATA SIM into the HUAWEI dongle for Internet connection. Typing this Gateway address in the browser , you get the HUAWEI CONFIGURATION window.Here the service provider (for me BSNL ) name is displayed with connection status. Click on CONNECTION SETTINGS seen below the “Connected” status. On left pane , under SECURITY tab select the VIRTUAL SERVER. 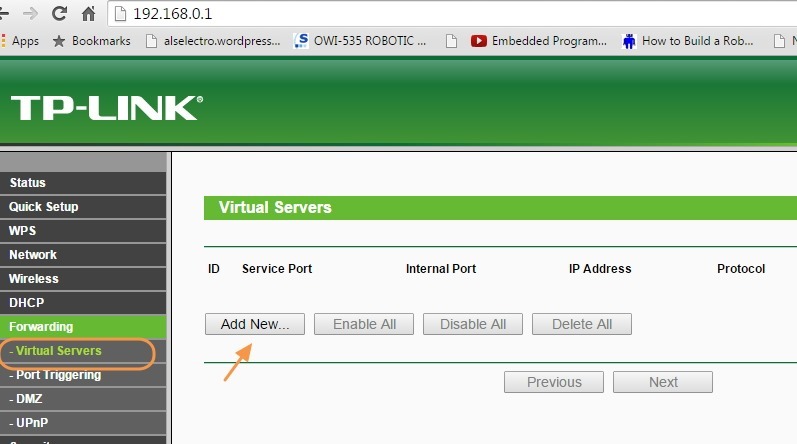 Before clicking the ADD button under VIRTUAL SERVER LIST , we’ve to configure the ESP module & start a SERVER on port 333. The ESP 8266 module is connected to PC through USB-TTL board & the COM port allotted in my PC is COM 48 . I’m using PUTTY terminal software to communicate with this COM port. 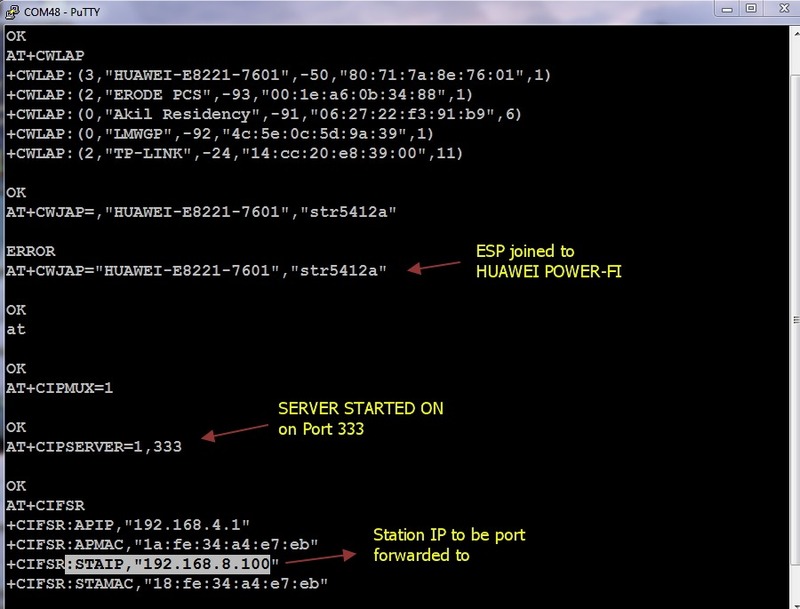 Following is the screen shot on which you can see the AT commands used to connect ESP with HUAWEI on WIFI , & starting a server on port 333. The selection of port is random.You can select any port within 65536 , except the standard ports like 80 (HTTP) , 21 (FTP), 23 (TELNET) ,etc..
AT+CWJAP=”ssid”,”password” – to join the AP using the SSID name & its password. 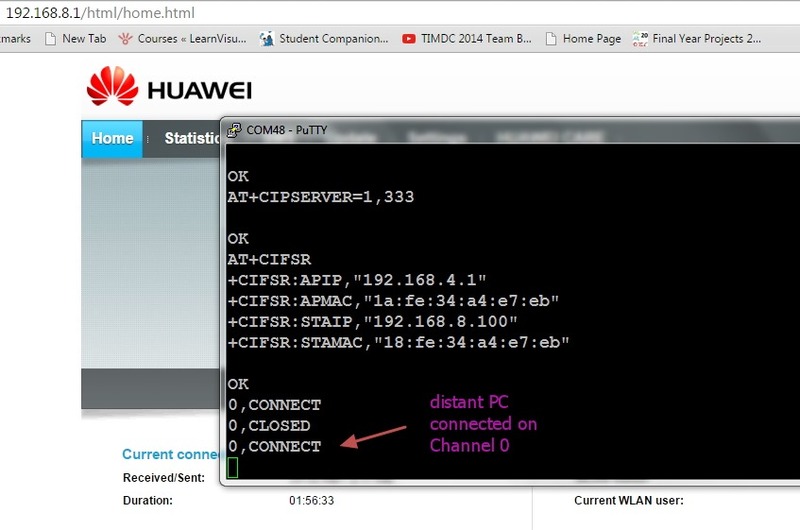 AT+CIFSR – displays the IP address . STAIP is the IP address we need to port forward. 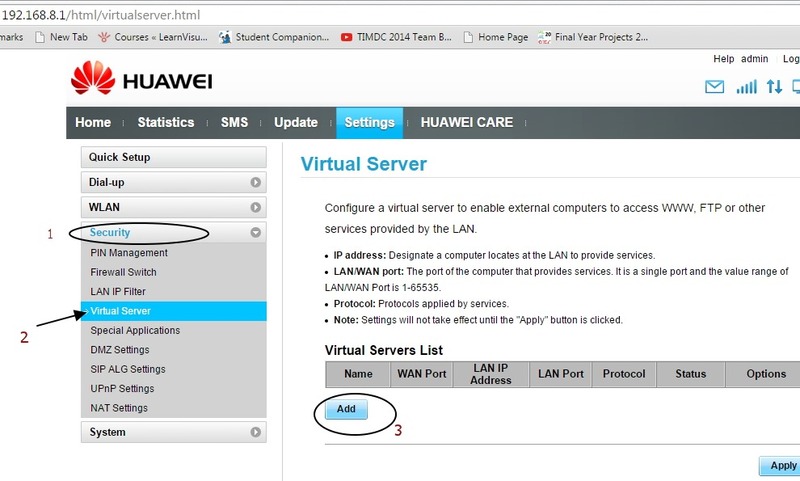 After starting the server on ESP8266 , we need to port forward under the HUAWEI configuration. Click on the ADD button , seen under VIRTUAL SERVER LIST. Needless to say , you’ve to apply an INBOUND RULE on Windows Firewall settings to allow this port 333 . (check the previous post on how to do this). You need to test this on the PC where you’ve connected the ESP module. 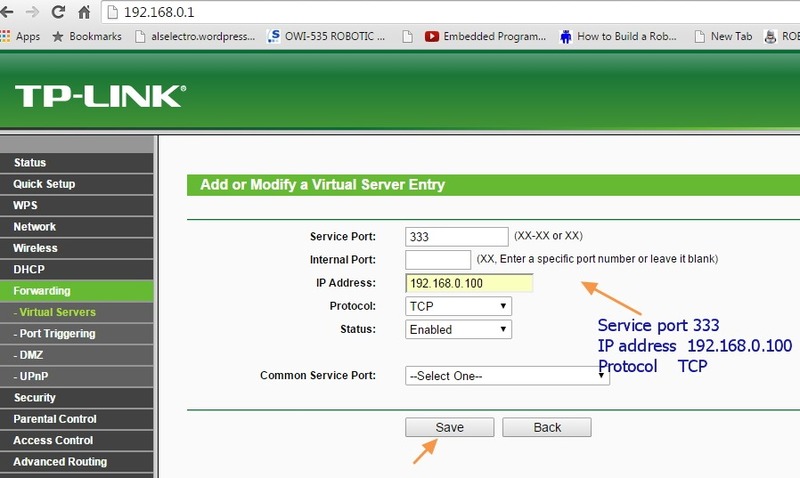 The external IP will be automatically displayed.You just type in the port no. to verify. Now we’re all set to contact ESP from outside World. From a distant PC with different Internet connection , open a PUTTY terminal. Select RAW as Connection type & type in the IP 117.252.205.55 & port no. as 333. 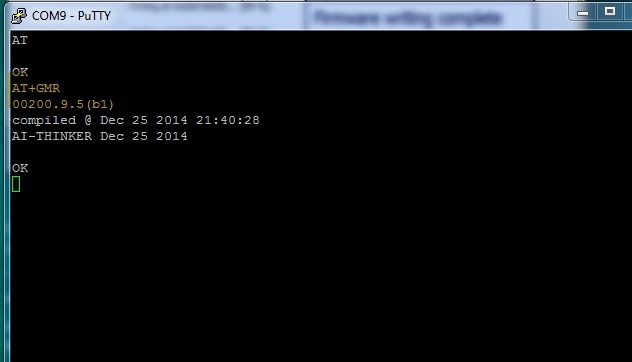 Following screen shot shows the PUTTY terminal which I’ve opened on a different PC with a different IP. This means a connection established on channel 0. 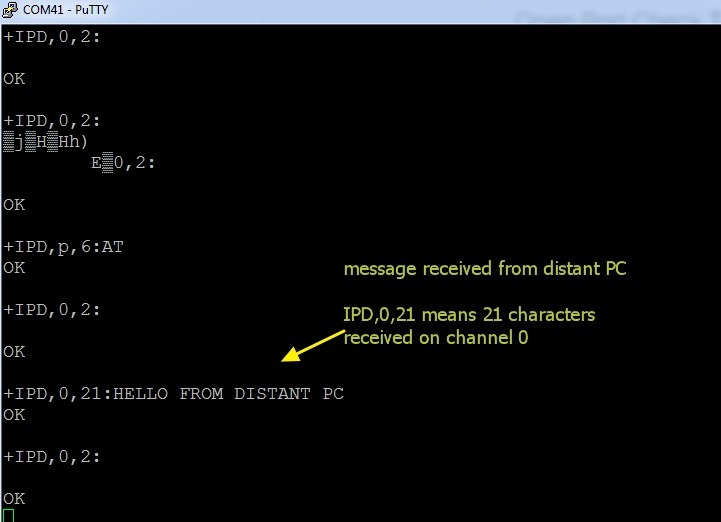 Now type in some characters on the distant PC terminal. which indicates , it has received 21 characters on channel 0. This indicates that you want to send 15 characters on channel 0. The ESP will respond with a > symbol & waits till you type 15 characters. 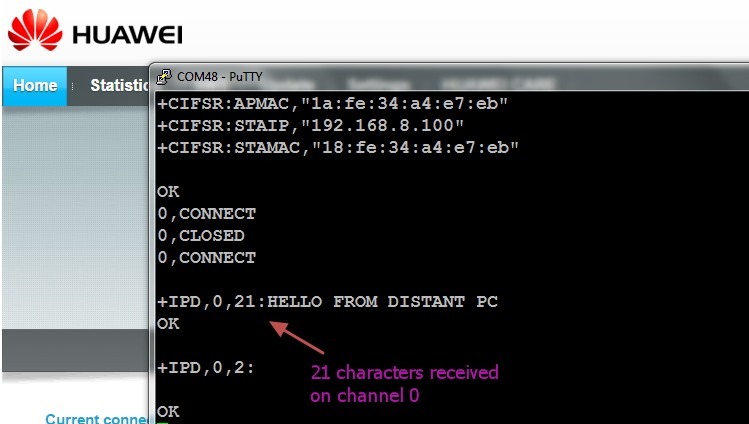 The distant PC now receives the 15 characters you typed inside ESP terminal. Hence a two communication is established with ESP Terminal & a PC from anywhere in the world.This opens the door for INTERNET OF THINGS where you can control the devices connected to ESP from anywhere in the World. 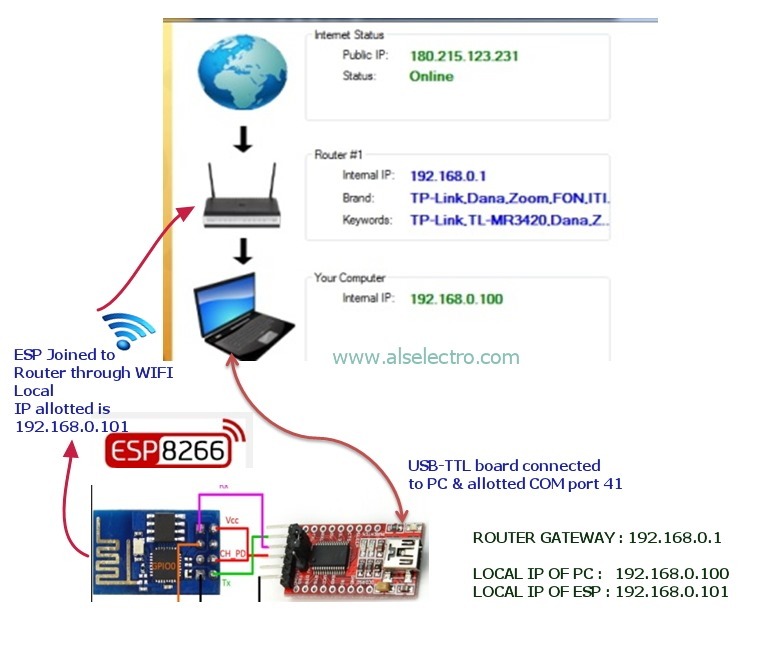 In the previous post we’ve seen the ways to control the ESP8266 WIFI module from anywhere in the world.The key to success depends on the PORT FORWARDING , where we route the contact on particular port to the local IP address of the WIFI module. Nowadays USB dongles are used widely for internet access .This post will help you troubleshoot PORT FORWARDING. Following is the SETUP diagram . TPLINK ROUTER is on the top of the NETWORK. 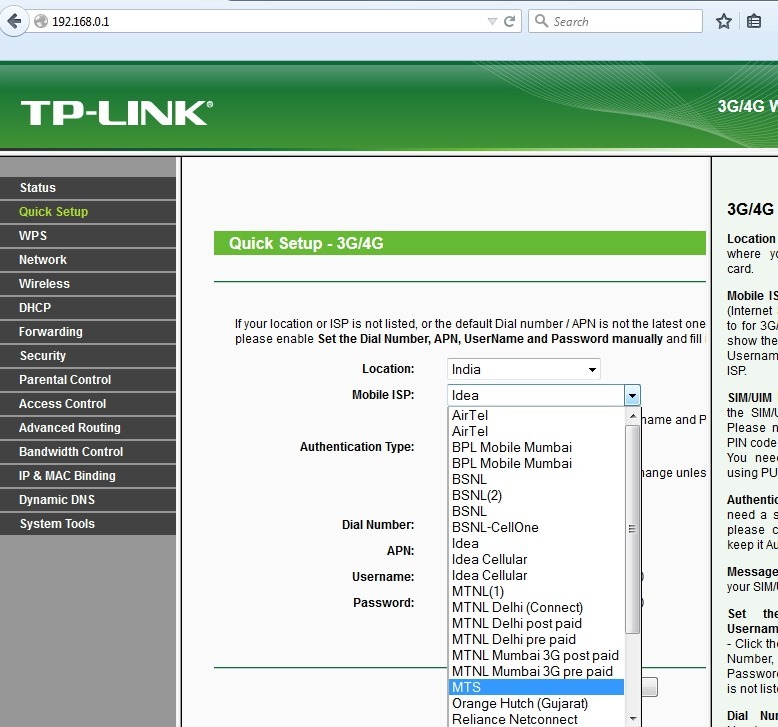 An MTS USB dongle is plugged to TPLINK Router (model TL-MR 3420 with 3G/4G support). 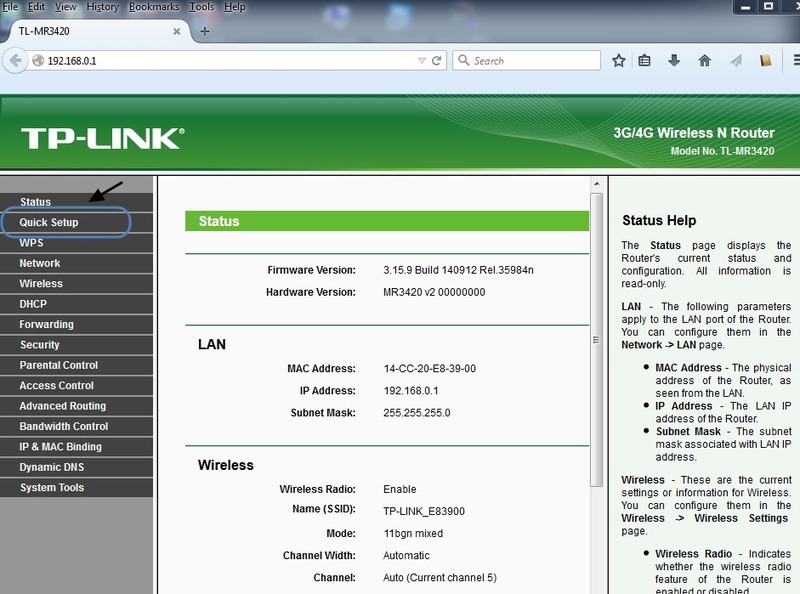 A Laptop is connected to TPLINK Router on Ethernet using RJ45 cable. 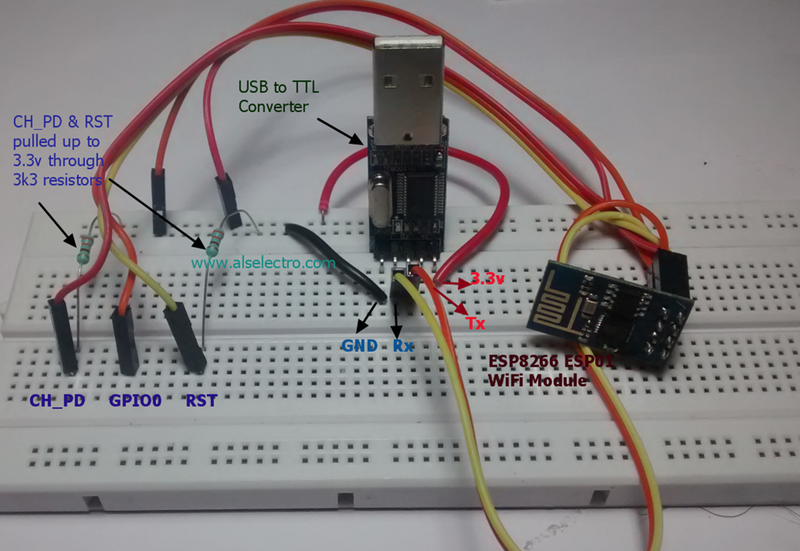 A USB to TTL board is connected to PC on which the ESP 8266 module is wired. On switching ON the ROUTER , it assigns LOCAL IP address to the modules connected to it either on RJ45 (wired) or on WIFI. & the ESP module which is connected on WIFI is assigned 192.168.0.101. Note that the allotment of address is on first come basis.When you power off & on the Router again , this allotment may vary. Address Reservation & then feed in the MAC address of the devices you’ve connected to the Router. To know the MAC address you can use the ADVANCED IP SCANNER TOOL. Download & install the tool. Start the scanner to know the IP address & MAC address of the devices connected . 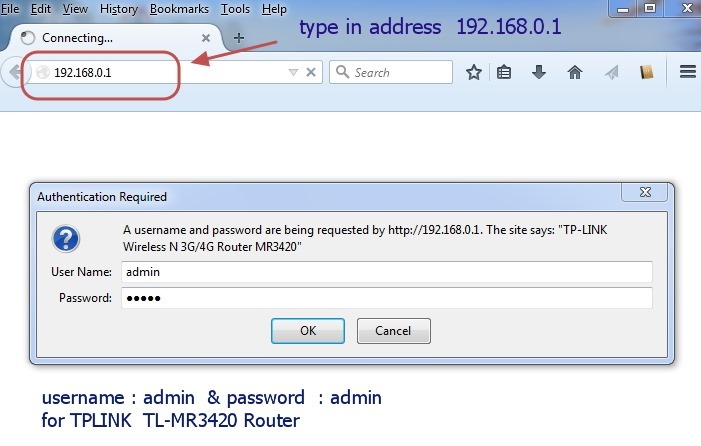 Confirm that you’ve Internet access after plugging the USB dongle to the TPLINK Router .You need to login the TPLINK configuration with address 192.168.0.1 & enter the QUICK SETUP for this process. To confirm that the port we’ve started server ( here port no. 333) is OPEN , we use a port scanner tool . Advanced Port Scanner is a small, fast, robust and easy-to-use port scanner for Win32 platform. It uses a multithread technique, so on fast machines you can scan ports very fast. 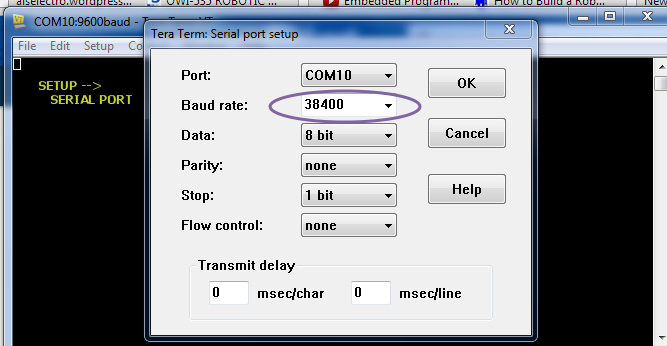 Also, it contains descriptions for common ports, and can perform scans on predefined port ranges. 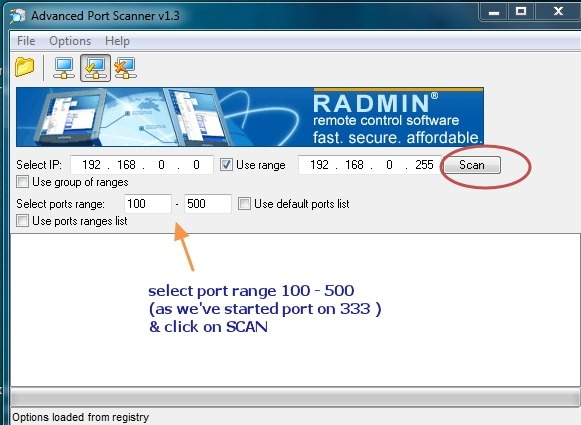 Open Port scanner & under Select port range enter 100 to 500 . As we’ve to check port 333 , we enter the range below 500 .Click on SCAN . 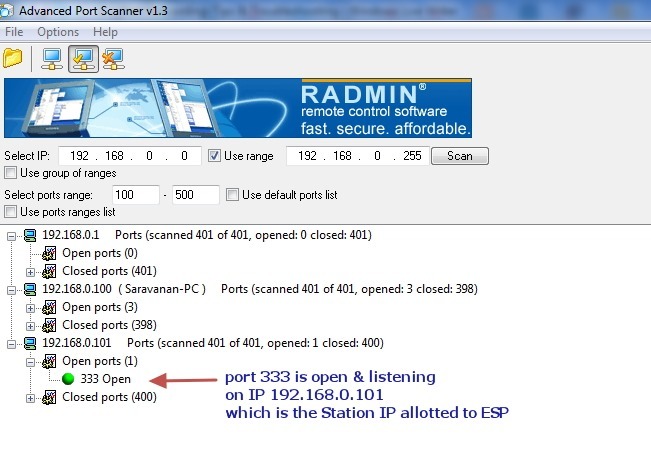 The PORT SCANNER displays the result regarding status of PORTs of your PC as well as the module connected to PC. Here we can confirm that port 333 is OPEN on IP 192.168.0.101 (ESP module). 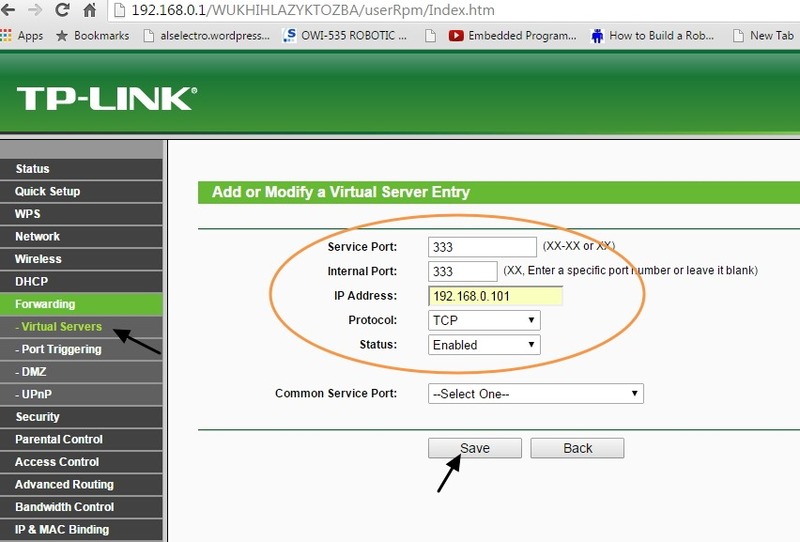 On TPLINK configuration window , under FORWARDING select the tab VIRTUAL SERVERS. Click on ADD NEW.. & enter the Service & Internal port as 333 . 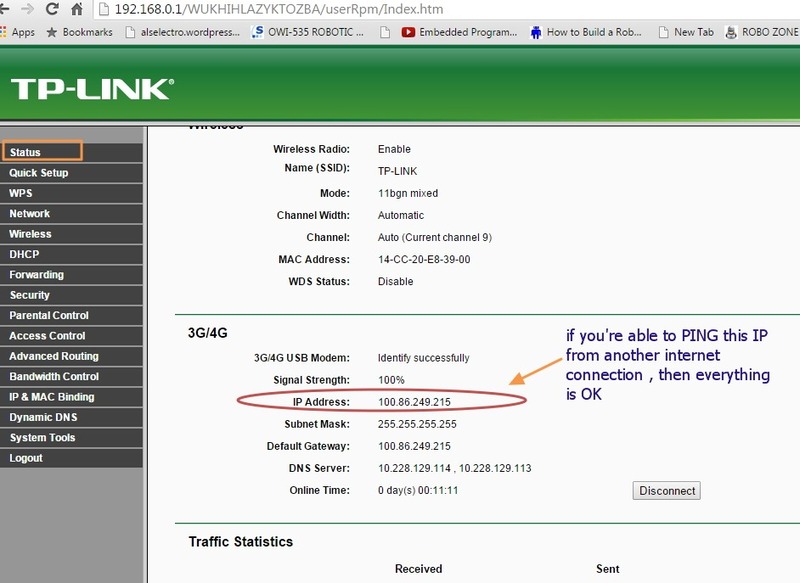 IP Address as 192.168.0.101 , which is the local IP allotted by Router to ESP module. Select Protocol as TCP & then SAVE the settings. 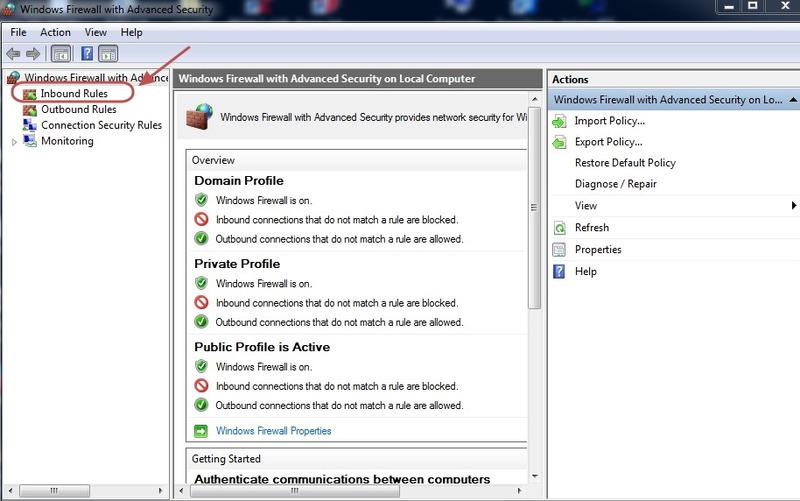 Open Windows Firewall Advanced settings & click on INBOUND RULES. SET the rule to allow communication on port 333. Now you are set to check the condition of PORT 333 externally. 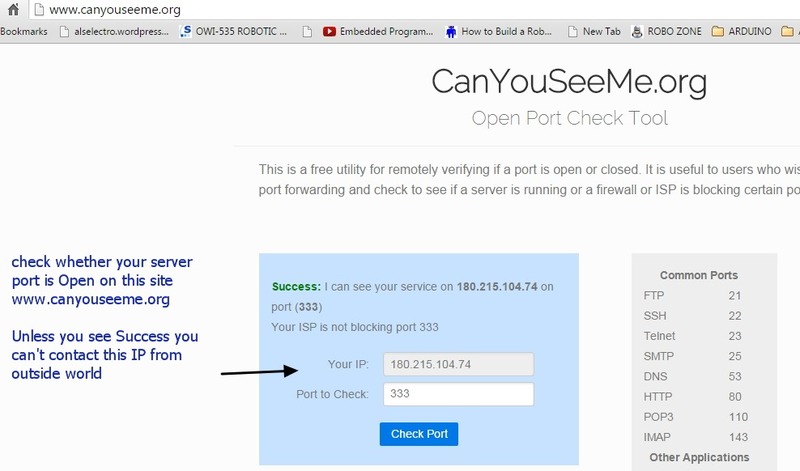 On opening the site your external IP will be automatically displayed.Enter the port number to check. 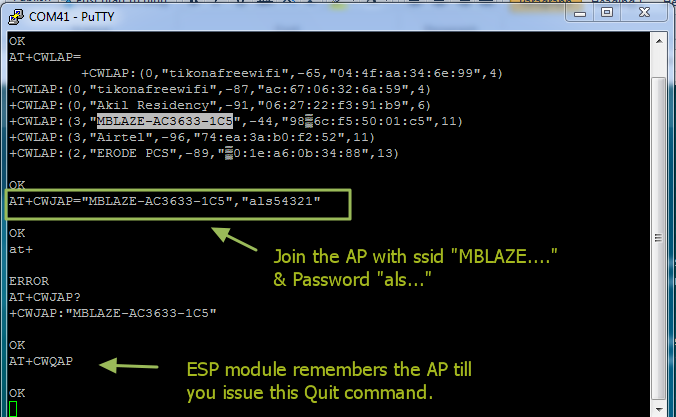 Unless you see SUCCESS on this test , you can’t contact your ESP module from external world. 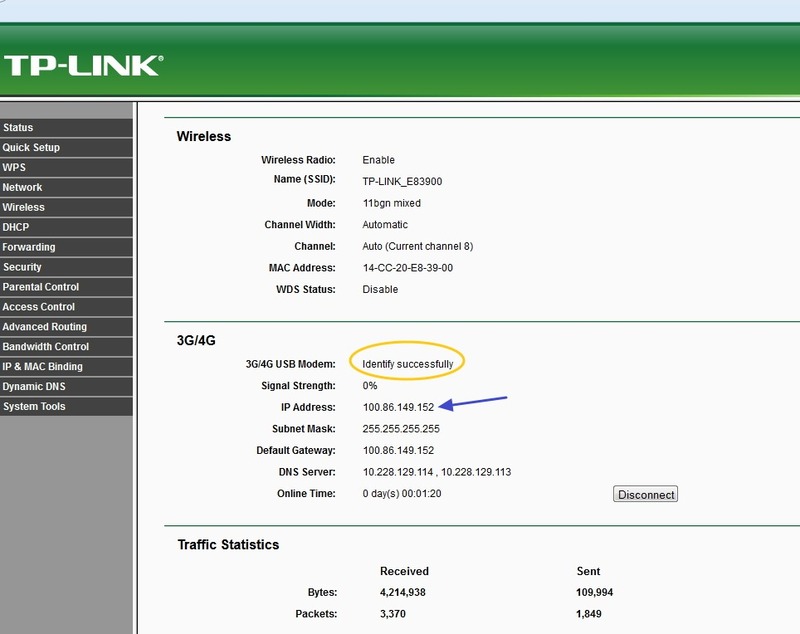 If you get ERROR , open the TPLINK configuration & click on STATUS. Note IP Address displayed under 3G/4G. From another computer with a different internet connection try to PING this IP address. 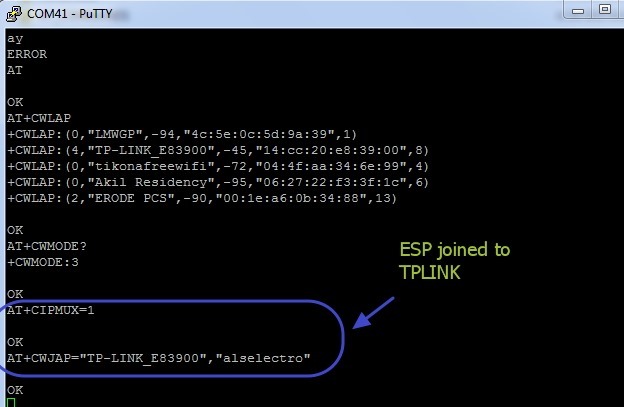 If the PING result is OK , you can be sure that the ESP module can be contacted from outside world. If the PING result is TIMED OUT , you can’t communicate with ESP. These are reserved by IANA for private Intranets & NOT ROUTABLE TO INTERNET. Private addresses are not reachable on the Internet. Therefore, Internet traffic from a host that has a private address must either send its requests to an Application layer gateway (such as a proxy server), which has a valid public address, or have its private address translated into a valid public address by a network address translator (NAT) before it is sent on the Internet. In my case , the MTS ISP provider hide the PUBLIC IP address. The MTS dongle does not support VIRTUAL SERVER settings , which means PORT FORWARDING IS NOT POSSIBLE with MTS. What I couldn’t understand was , while writing my previous blog ,it worked sometimes.While MTS customer support was contacted repeatedly , they finally accepted that port forwarding is blocked by them. After sleepless nights I’ve found a solution….. Read on my next post …. In the previous posts we’ve tested the WIFI module in TCP Server/Client mode & how to control from an Android mobile.These are related to LAN – Local Area Network where the WIFI module & Mobile are connected to the same ACCESS POINT (AP). The AP I’ve used is a WIFI Dongle MTS MBLAZE. For the outside world to contact the ESP module connected to MTS , PORT FORWARDING should be done. 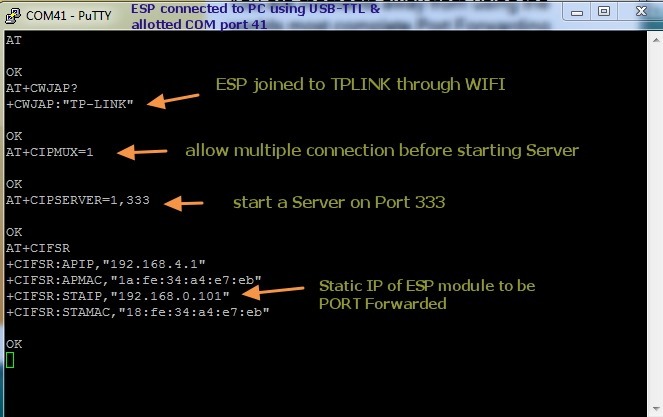 This is a method by which the IP address of ESP module is forwarded , so that any one accessing the particular port of external IP will land on the ESP module. The problem is WIFI Dongles do not allow Port Forwarding . 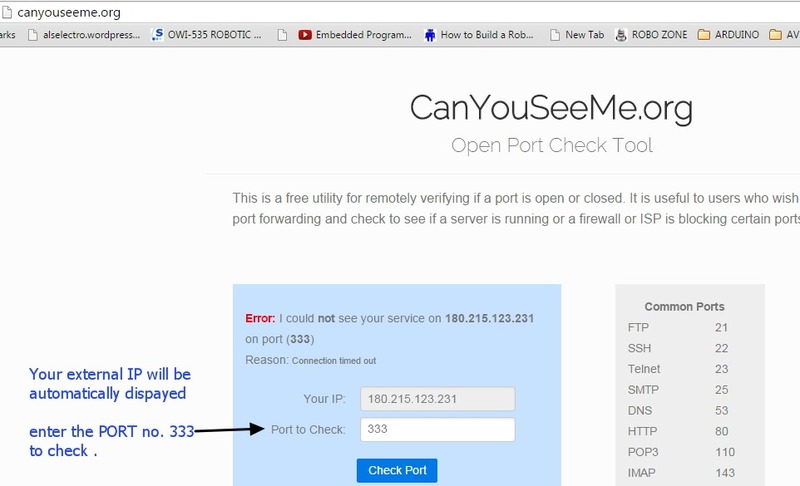 As I’ve previous experience in CCTV DVR port forwarding (you can watch my video on DVR port forwarding Here ) using land line Internet connection , I decided to apply the same technique for ESP WIFI. No Internet Dongle allows port forwarding. TPLINK MR3420 Wireless 3G/4G Router came to my rescue. The TPLINK Router accepts USB Dongle as well as WAN connection.I plugged in my MTS dongle to the USB port of TPLINK. One of the Ethernet ports is connected to the PC using RJ45 cable. 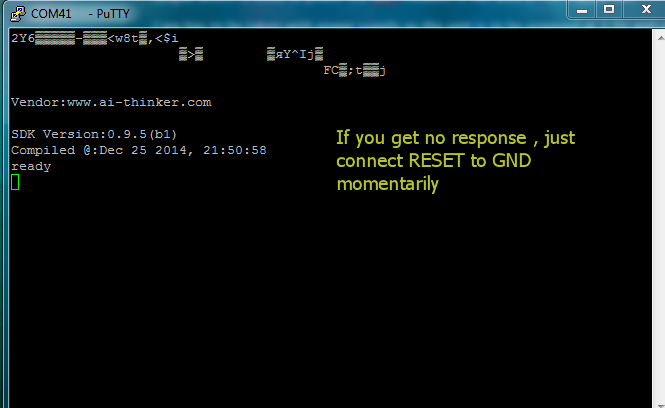 To know the Routers IP , you can type in CMD to open Command window . 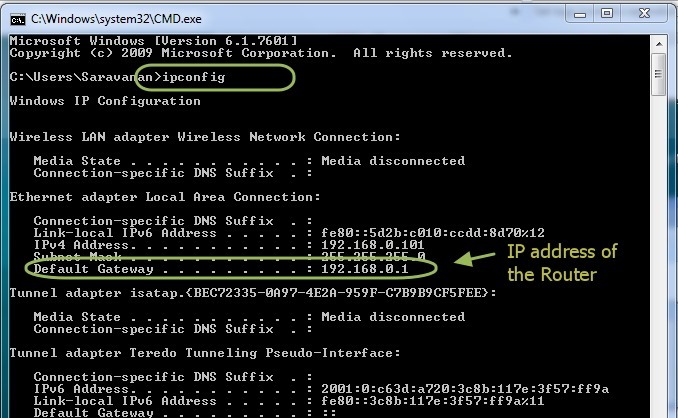 After the prompt type the command “ipconfig” .The Default Gateway address is the IP of Router. 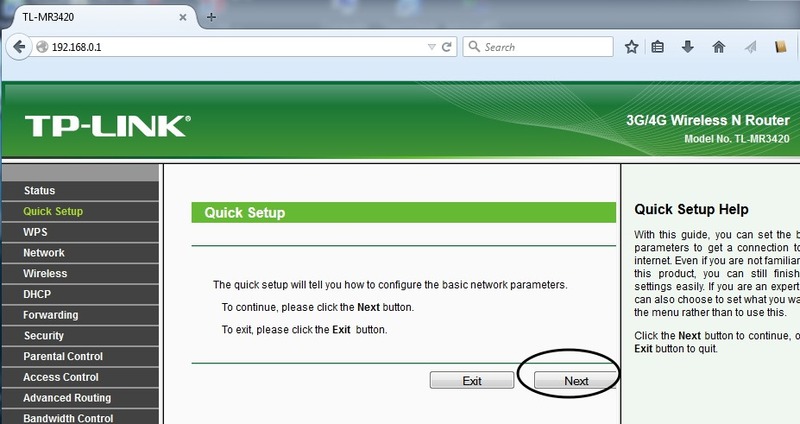 The configuration window of Router appears. Select Internet access mode as “3G/4G ONLY”. Select your Mobile ISP from the drop down menu .Mine is MTS . Rest of the settings you can leave it for defaults. 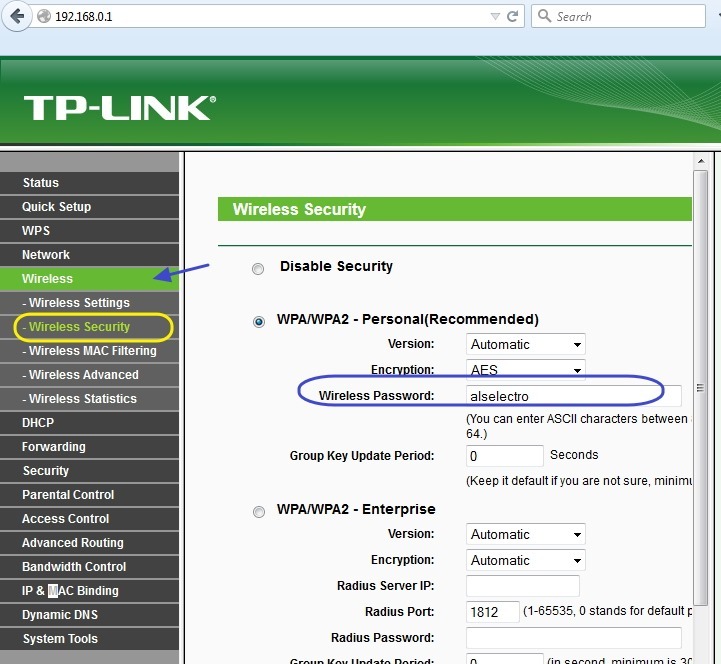 Click NEXT & under Wireless Security select WPA2_PSK mode & provide a password. Click Next & then FINISH to complete the quick setup. For now the TPLINK Configuration is completed.We shall connect the ESP WIFI to TPLINK Access Point , Start a Server on ESP Module & again come back to TPLINK to configure PORT FORWARDING. 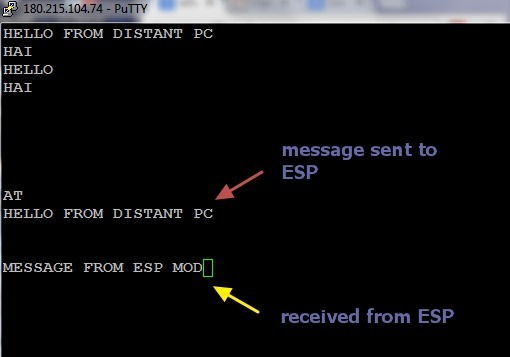 We make use of Putty Terminal software to communicate with ESP module. 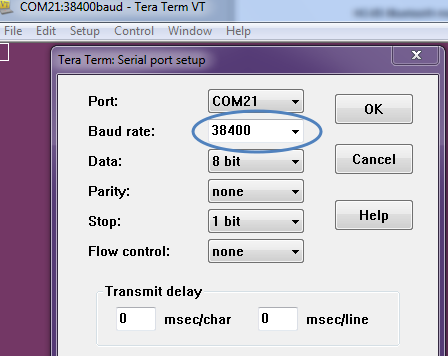 Open Putty & select Serial .Feed in the COM port where ESP is connected (through USB –TTL board) & select the Baud rate as 9600. Now if you type in AT , you get OK response. 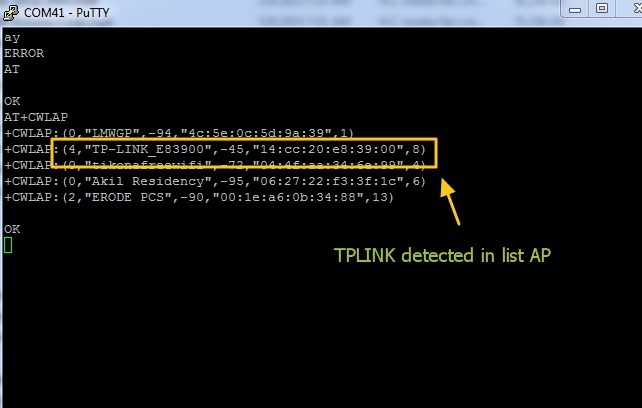 You can see the TP-LINK under listed APs. 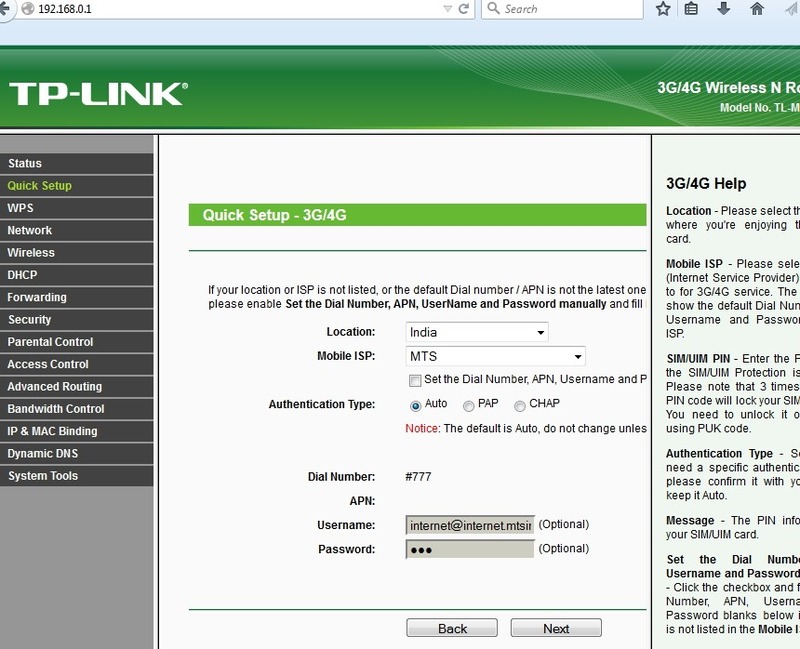 Join TPLINK AP using the password we’ve setup already with the Router. This returns the Access Point IP & the Station IP. If CWMODE =1 , you get only the STAIP. Default is CWMODE=3 , which gives both IPs. This Station IP is an Internal IP & cannot be contacted from outside world.To enable contact this IP , we need to PORT FORWARD . As we’ve started a Server on port 333 , we shall forward any contact on this port to the Station IP. Enter the Service port as 333 , as we’ve started a server on this port on ESP. 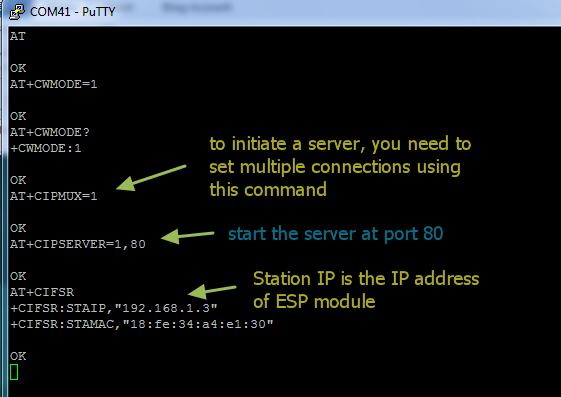 Fill in IP address as 192.168.0.100 , which is the Station IP of ESP. Select Protocol as TCP & Status Enabled. Click on SAVE . 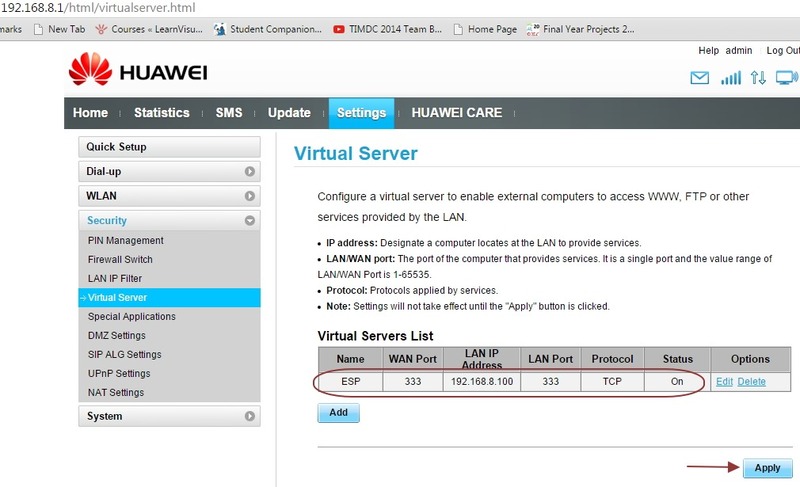 The Internal port will be assigned same as Service port automatically. 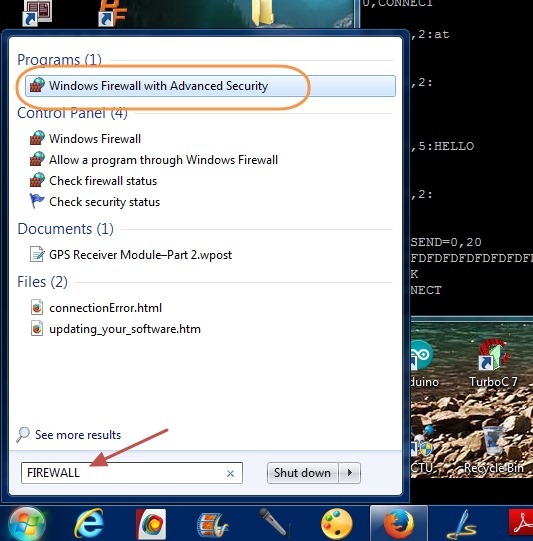 Now we need to allow this port for incoming traffic on the Windows Firewall settings. 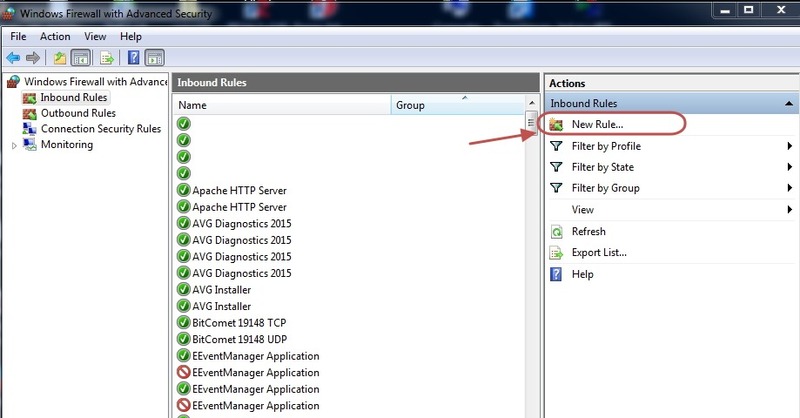 Select “INBOUND RULES “ on the left pane. Select PORT as Rule type on the next screen. 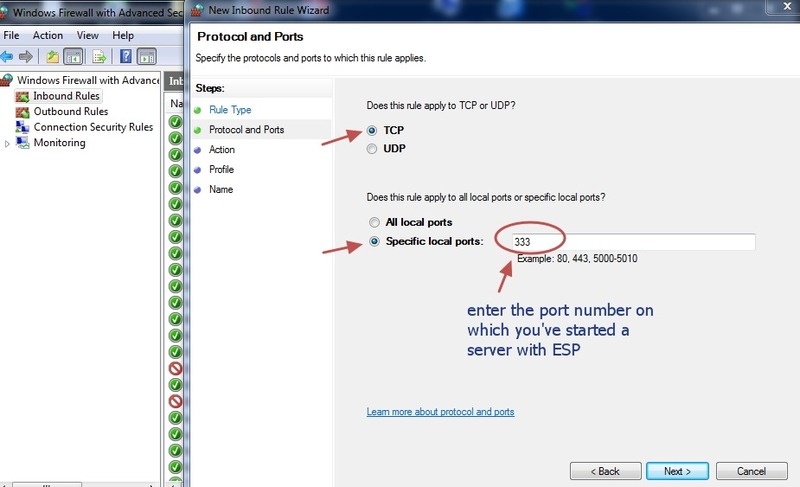 Select Protocol as TCP & enter the port number 333 under Specific Local Ports. Select “Allow the Connection “. Apply rule to all Domain,Private & Public. You can name the rule & click Finish to save it. The Router is accessed from outside world by its external IP. This external IP is assigned by the ISP provider.Generally this IP is DYNAMIC ,which means every time you switch on your Router , a different IP is assigned. For a fixed IP , you’ve to contact your ISP provider & pay for a STATIC IP. Your public IP address will be displayed.Note that down. Now we shall check whether the port 333 is open or not. & click on CHECK PORT. 1. 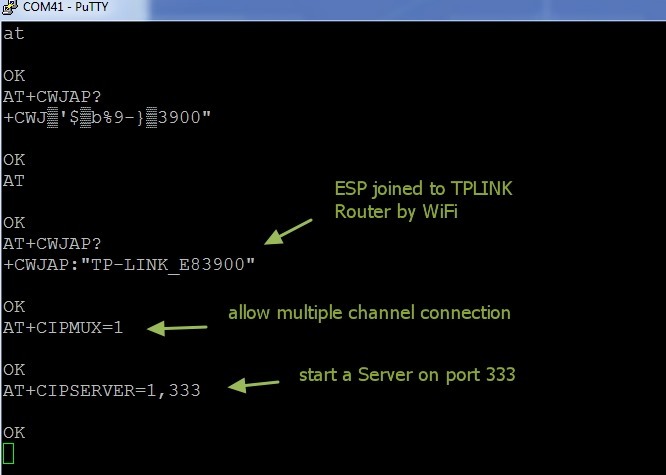 Router TPLINK Port Forwarding setting is done so that incoming request on port 333 is forwarded to the Station IP of ESP. 2. 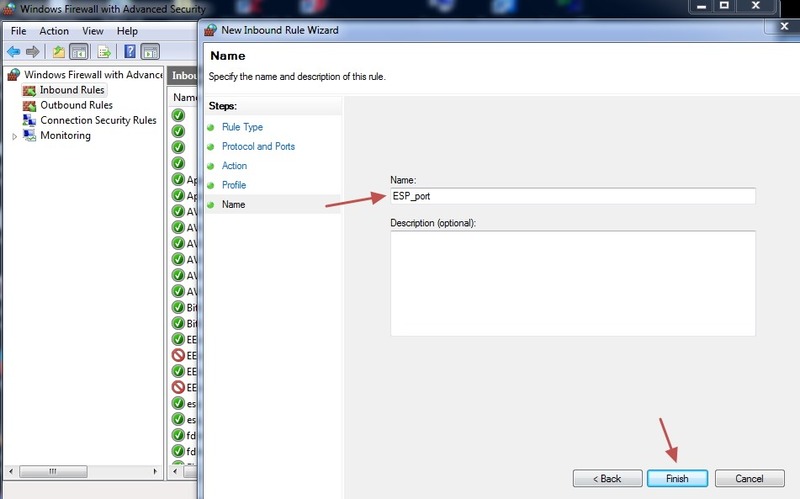 Windows Firewall setting Inbound Rule is set to allow communication on port 333. Only on getting SUCCESS message under Canyouseeme.org you can proceed further. Till now all settings & configurations are done on PC connected with TPLINK & ESP. Next is the final step in which another PC is involved from anywhere in the world. For demo purpose I’m using a separate PC with a different Internet connection. You can see from screen shot below the IP address of the distant PC. 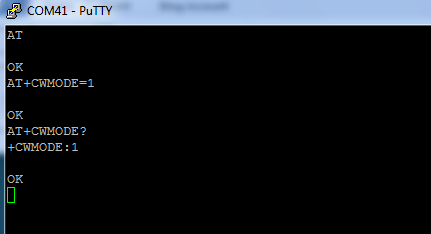 Open Putty window in that PC & select RAW as Connection type. After entering the details , click on Load button. From distant PC Putty window type in some characters .This will be received in the ESP window. This command waits for you to type 20 characters to be sent on channel 0. The following is the screen shot of Distant PC Putty window. Note the IP address of distant PC on top of putty window. 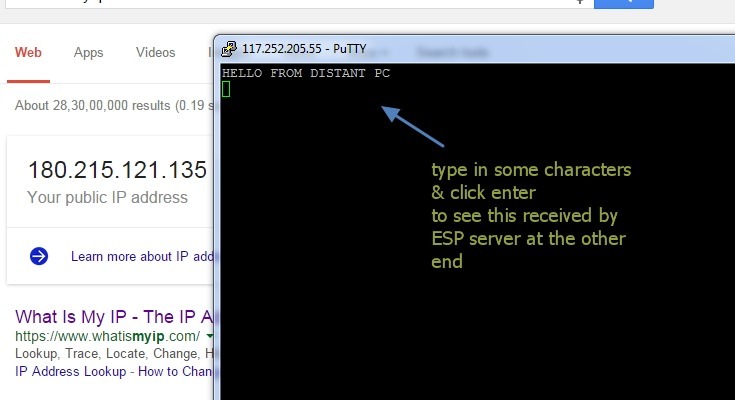 Once you know the external public IP address of the Router & the Port number on which the server is started, you can contact this ESP from anywhere in the world !!!! In the previous post we’ve seen how to initiate ESP module & use AT commands.In this post TCP CLIENT mode operation is explained. 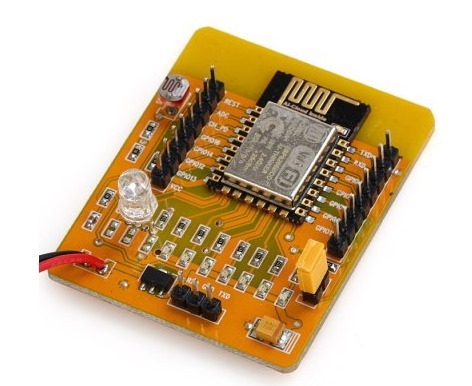 ESP8266 WIFI module has 3 modes of operation. ST – Station mode in which ESP acts as a device & connects to an existing Access point. AP – Access Point mode where the ESP itself acts as AP & other devices like Mobile can connect to it. AT+CWMODE = 1 for ST mode , 2 for AP mode & 3 for both. This initiates the server for a Webserver. The module returns the Station IP address , 192.168.1.3 . 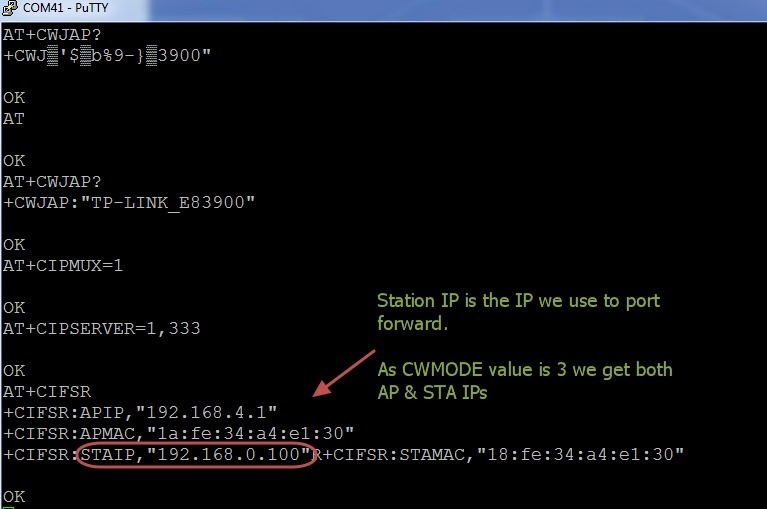 If the CWMODE is set to 3 , you’ll get 2 IP address , one for AP & another for Station mode.We need the station IP address for Client mode operation. 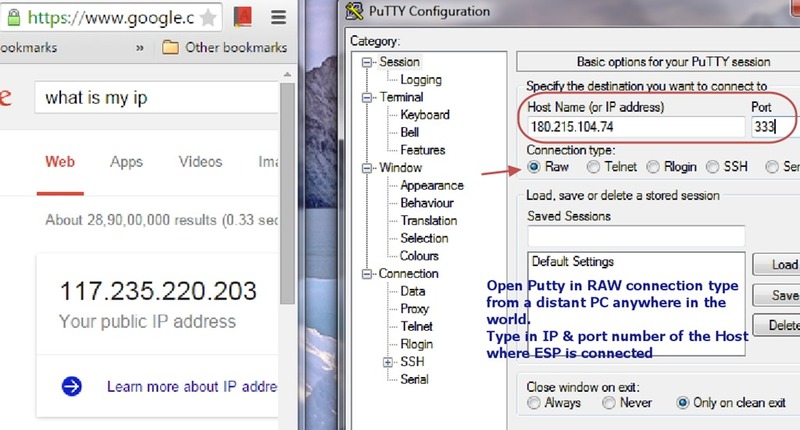 The browser sends a HTTP GET request which is displayed on the putty window where ESP module is connected.The host IP address & the user agent (your web browser name) are displayed. 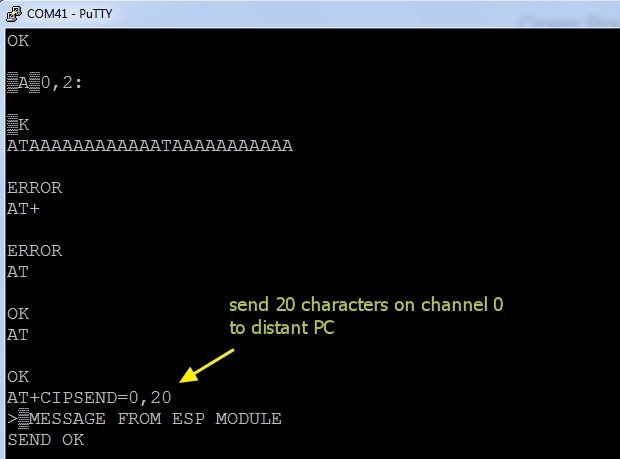 This command is to send 30 characters through channel 0 .Use the channel number which is displayed as CONNECT while a request is received from the browser. Now you get a > symbol , after which you’ve to type in 30 characters. The module will wait till you type in 30 characters & finally displays SEND OK.
You’ve to type characters within the Timeout limit.Otherwise the link will be closed. Now the characters are sent to the Web browser. But the browser is still waiting for the channel to be closed. Here use the channel number ( 0) where the connection was established . Once the channel is closed , you get the characters displayed on the browser. The above one displays characters using HTML tag type Heading 1. For testing 2 way communication , open another instance of PUTTY . 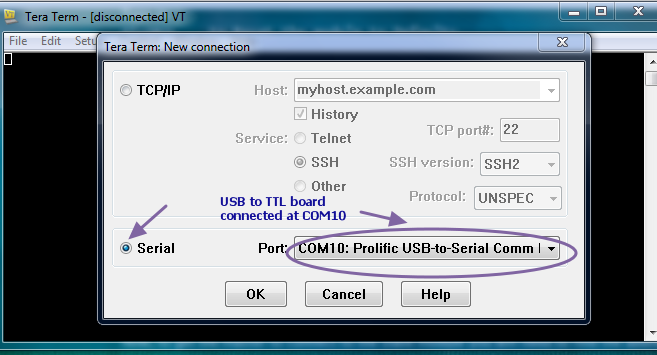 Select connection type as TELNET & Port 80. 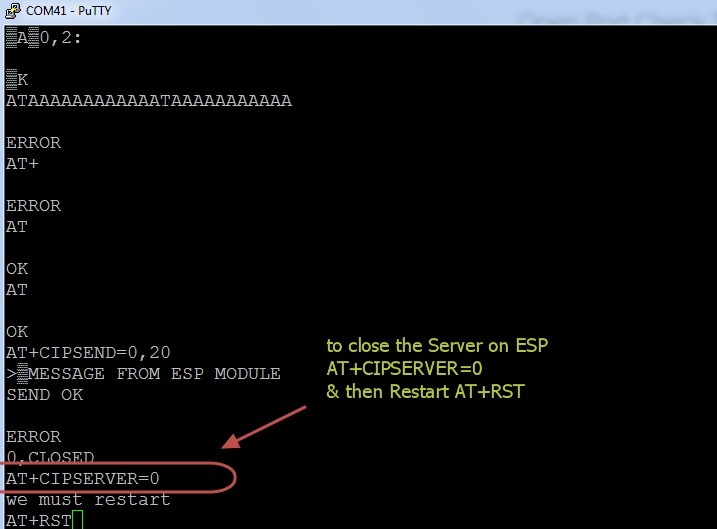 Type in the host address , which you get by AT+CIFSR command in ESP window. 0 is the channel of communication & 17 is the number of characters received. ESP will wait till you type 20 characters. On TELNET window the characters are received. The Bluetooth module HC-05 is a MASTER/SLAVE module.The Role of the module (Master or Slave) can be configured only by AT COMMANDS. By default the factory setting is SLAVE. Remember the models HC-04 or HC-06 are SLAVE only modules .HC-05 is the module of interest in this post.To identify the model you can see the pin count.If the module has 5 or 6 pins it is HC-05.If the module has only 4 pins then it is HC-04 or HC-06. The firmware for HC04 is LINVOR & for the HC05 it is HC05 itself.If you scan for bluetooth devices from your Android phone you can see this name. The extra pins in HC-05 are the KEY & STATE pins.The KEY pin is used to enter the Command mode. 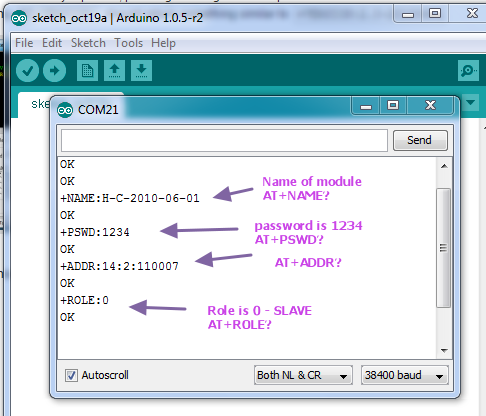 The slave modules can not initiate a connection to another Bluetooth device, but can accept connections.Master module can initiate a connection to other devices. Be sure not to make the mistake of buying 2 slaves (HC-04) . 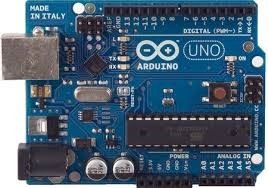 To enter the Command mode you can either use an USB TO TTL Module or your Arduino UNO board. Connect Rx (pin 0) of Arduino to Rx of Bluetooth module. Tx (pin1) of Arduino to Tx of Bluetooth module. 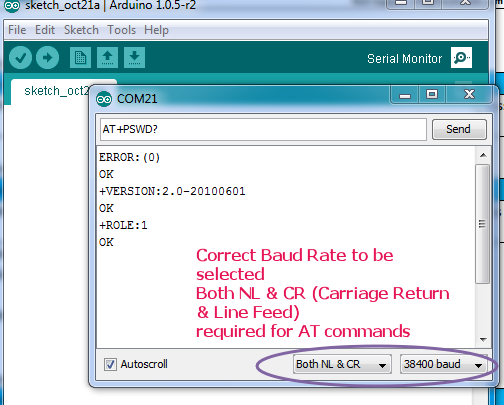 Yes,I’m correct.The connection is one to one while using Arduino as USB-UART board.It is not the other way (Tx to Rx while using USB-TTL board). 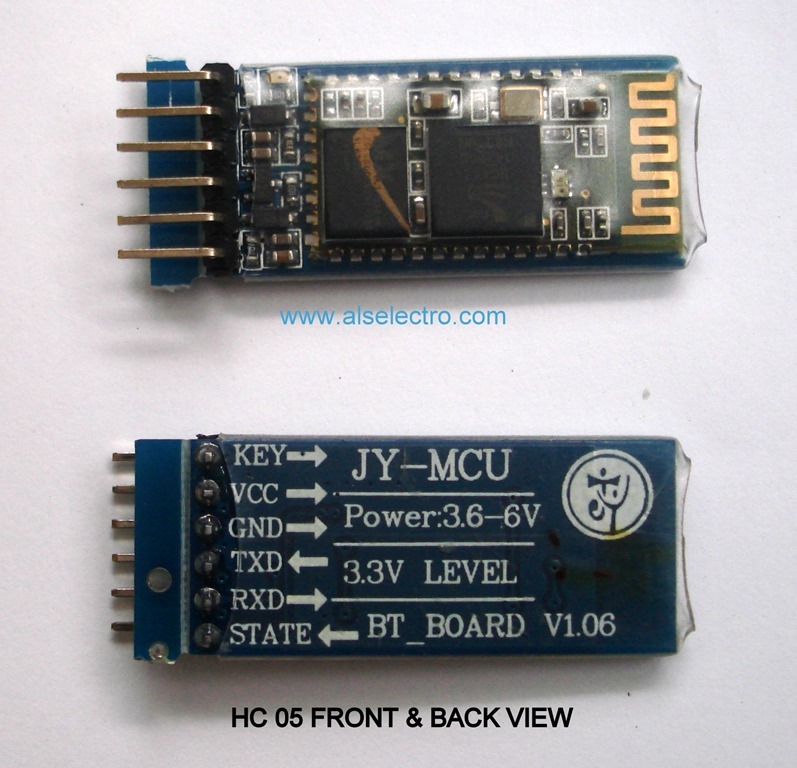 Before connecting the power to HC05 module you should know that there are there are two ways of activating command mode on these devices. The other is to hold pin 34 low then set it high after the module has been powered on and it will enter command mode at the pre-programmed speed (default is 9600,8,N,1). Let us complete all the connections and finally provide power to the module. The Status LED starts blinking slowly (once per 2 secs).This indicates that the module has entered the command mode at the BAUD RATE 38400. You can use the SERIAL Monitor of the Arduino to feed AT commands. HC 05 module needs a CARRIAGE RETURN & LINE FEED after each command . Type in AT & click on Send. You should get a OK response from the module. The module responds with OK.
To confirm , type in AT+ROLE ? The module will reply the status as ROLE 1. 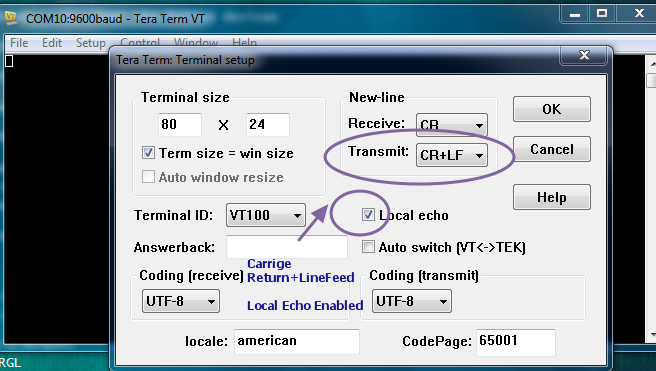 You can also use a Terminal software like TERATERM to feed the AT Commands. 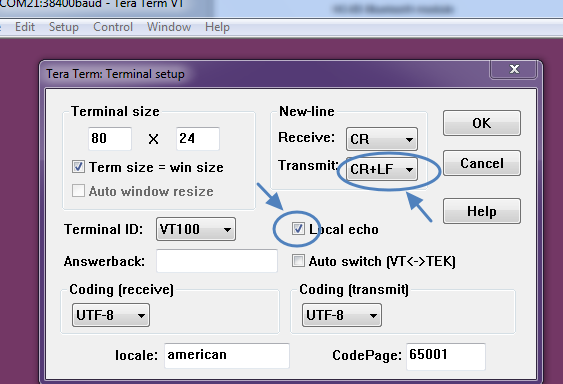 Close the Serial monitor of Arduino & then start the TERATERM terminal. 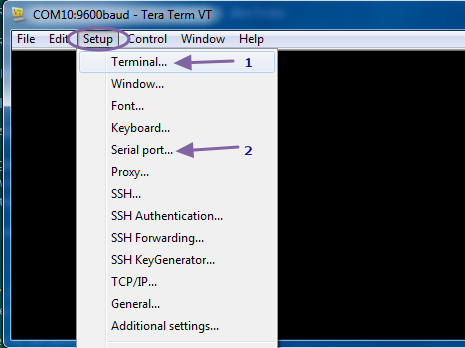 Select Serial at the start up window of TERATERM. Now you are ready to feed the AT commands. To query a condition like Name, Password ,etc. you need to use a ? question mark after the command. To change the condition use the equal to mark = after the command. For e.g to query about password you type in AT+PSWD? In the next post we shall see how to pair 2 nos. HC-05 modules so that it can replace the physical Serial connection.This can be an alternative to ZIGBEE , but with less range and more data speed (2Mbps). The easiest & economical way to go wireless in an Embedded project is through a Bluetooth module.Your Serial communication goes Wireless using this module. The types available in the market are HC-04 , HC 05 & HC06 .The HC 05 is a Master/Slave module & the other two models are Slave only models.The Slave only models need a Master like Android phone to get paired. HC05 model can be configured either for a Master or for a Slave mode , thus most preferred for a Microcontroller project. The HC-05 module can build a connection to other modules, while HC04/HC-06 modules can be a slave only.Two Slave modules cannot communicate with each other themselves. 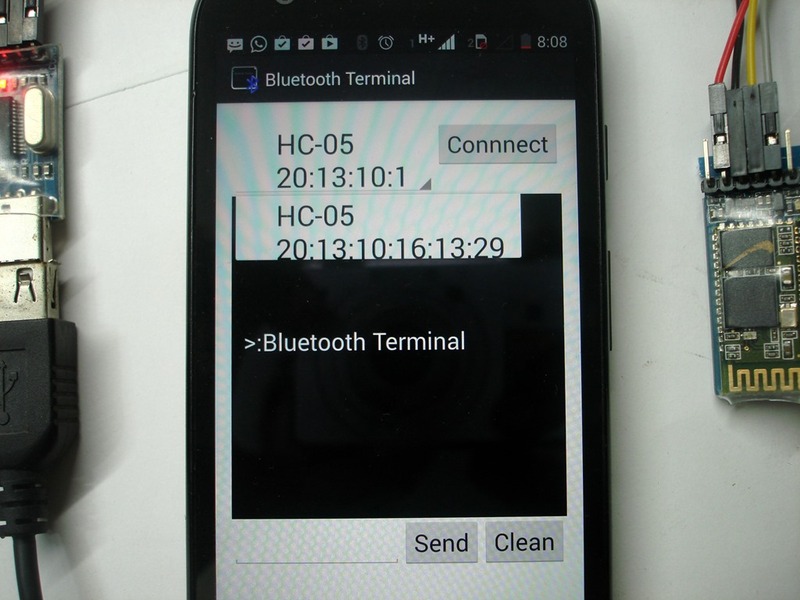 HC04 is factory loaded with LINVOR firmware.If you power up the module and scan for Bluetooth devices using your Android phone , you can see the name LINVOR on the phone.If the module is HC05 , you see the name HC05 on the phone. The square wave like design on the top of module acts as antenna & the range is about 30 feet. Above is the picture of a raw HC05 Bluetooth module .The module operates on 3.3 V DC power & the acceptable TX/RX signal level is 3.3v & not 5v. The KEY pin (pin 34) on a HC05 module plays an important role in entering AT mode of the module. 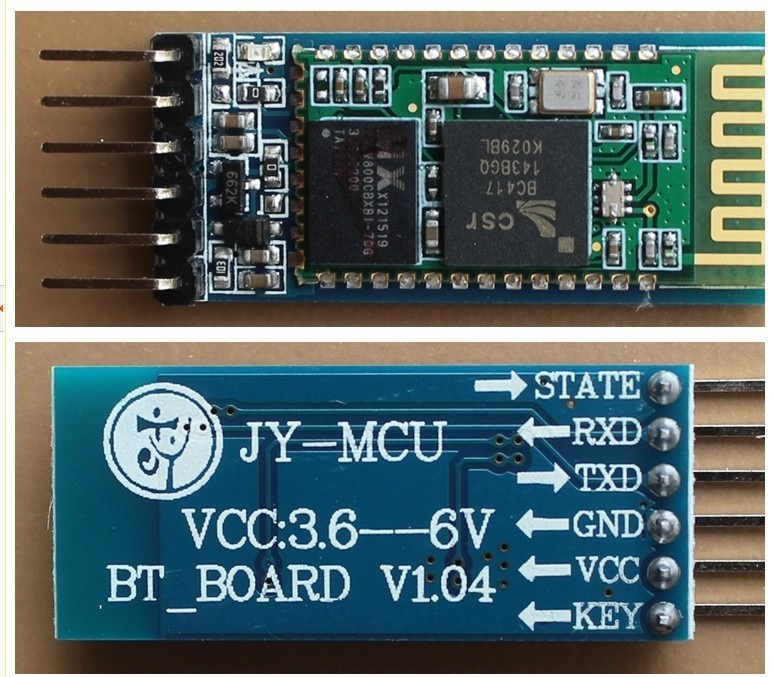 I suggest to buy a module on a breakout board and available as JY-MCU modules.The Bluetooth module is mounted on a breakout board and connections provided using header pins.You can safely provide 5v power to this board, as it has an inbuilt 3.3v regulator.Also the board has Status LEDs for visual indication of status of module. The module is covered with a plastic transparent sleeve.If you need to access all the pins , cut this sleeve out.Mostly the header pin connections extended is enough for connection to a microcontroller. To connect this module to a Laptop an USB to TTL converter board built on Prolific’s 2303 IC is required. This is an inexpensive module with USB at front & header pins for connections.When connected to PC you need to install the driver for Prolific 2303. Now plug the USB connector to a port on your PC.The power LED on USB board glows & the Status LED on Bluetooth board starts blinking fast , indicating that it looks for a pair. 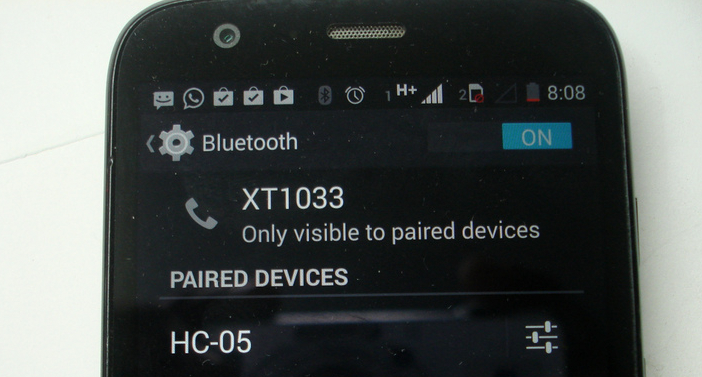 From your Android phone , go to Settings , switch ON the Bluetooth & under properties Scan for available Devices. 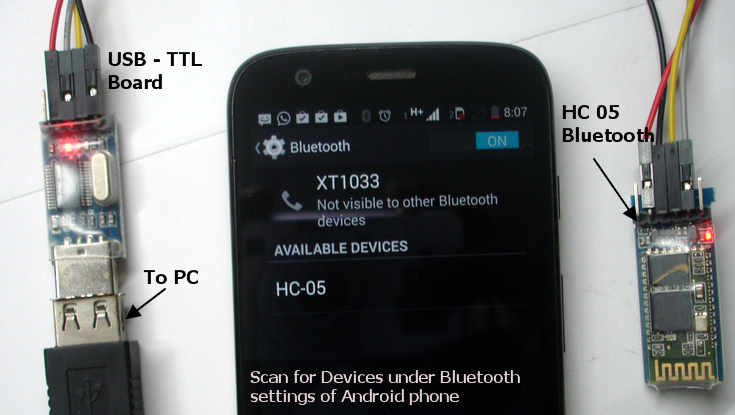 The Bluetooth module will show up as HC-05 under Available Devices. 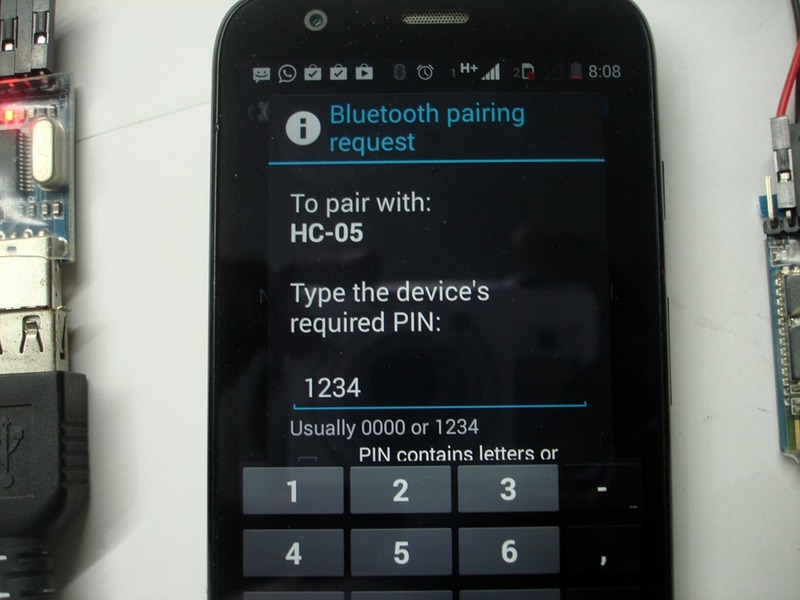 Touch on the HC-05 & feed the PIN password as 1234. Touch OK to see the HC-05 under paired Devices. To communicate with PC you need Terminal software on Android phone as well as on the PC. 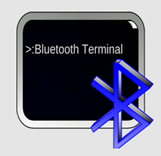 From Android’s Market search for “BLUETOOTH TERMINAL”. Select the one with Bluetooth symbol and install it. Open the installed Bluetooth terminal.On the top you can see a Connect button & to its left bottom a small drop down arrow is seen.Touch that drop down to see the available devices. Now the fast blinking of LED on HC05 SLOWS DOWN TO ONE BLINK per second indicating that it has been paired with a Master ( Android phone). Now we’ve to install a Terminal software like Putty or CoolTerm on your PC. 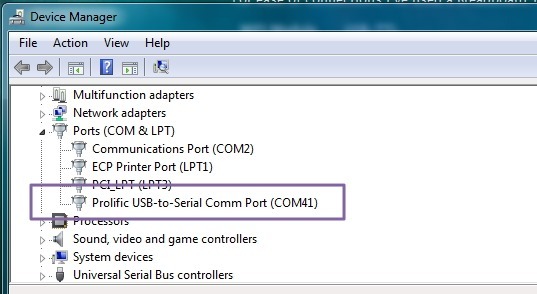 Open Putty & under Session select Serial.Enter the COM port allotted to the USB-TTL board (here it is COM 10).This can be noted down from the Device Manager’s COM port allocation. Enter the Speed as 9600 which is the Baud Rate of communication. 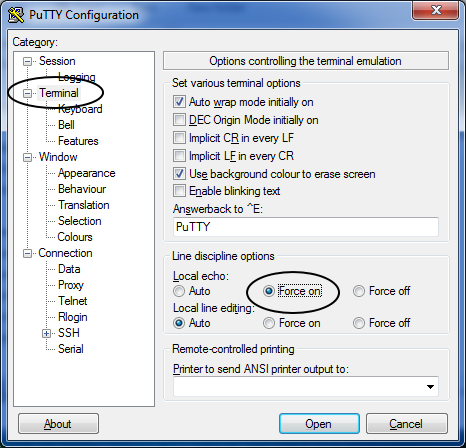 Under Terminal Settings ensure that Local Echo – Force ON is selected.This enables you to see what you type on Putty screen. Click on Open to see the Terminal window for communication. If the connection is lost Touch Connect again on the phone. Type in some characters on the Phone & touch SEND. You can receive the characters on the Putty screen. Same way type in some characters inside Putty screen to see them received on the phone.Thus a 2 way communication is established. You can also test a Loopback method. Connect the Tx & Rx of Bluetooth module together .For this test PC 7 USB board are not required.Just you need to provide 5v power to module & loop the Tx/Rx. Now the characters sent will be received back.